It’s been 2 and a half years, my friends. 2 and a half years since we first put LambdaGeneration on the map and brought you a new home for all your Valve community news and media. We’ve reported on many of the past years’ most significant events, releases and creations. Though it’s more than a little disappointing that I won’t be able to discuss the… eventual announcement and eventual release of Half-Life 3 with you all, the news will make the rounds all over the web, and I think we’ll all be able to make up our minds on our own about what Valve has to offer. This applies for all of their upcoming projects too, including the rather shocking possibility of a Left 4 Dead 3 on the horizon. In any case, for yours truly, Vic, lead editor of LambdaGen, it’s time for me to pass the torch (well, if there’s anyone to pass it to), as far as running the show here on the main page as head writerman. I wish I didn’t have to leave on a lingering note of inactivity, but some finality was the least I could offer. In case you never noticed, LambdaGeneration did not start with me, and nor will it end with me. Alex, our founder and administrator has got some really significant plans for the future of the site, through that huge site update we’ve been talking about for a long while now, and LambdaGeneration may very well go into newer and more compelling places than just my news writing – for instance, a much greater focus on community activities and creations. Like the numerous valuable pieces of fanart, fanfilm, modding and so on that sometimes go unnoticed by the greater community, on a regular basis. Aside from that, this revised site vision also calls for a more exclusive focus on Half-Life and Half-Life while decreasing focus on Valve’s other games. Alex thinks that needs to become LambdaGeneration’s main focus, going forward. And so, that’s something I’d probably take more of a support role in – simply taking a backseat as we experiment with a whole new direction for the site. It’s not at all my forte, and while it is something I can appreciate as a fan, it’s not something I could function within or contribute to consistently (especially with regards to restricting the site’s creative focus down to just Half-Life); it’s simply not the best way for me to contribute to the fan community. I have expressed my intent to get off on this train stop to Alex, and we both agreed that this brave new site would have to go forward at all costs. And again, this isn’t goodbye. I will still be around – not only as a fan, but also as an active community member (I’ll continue commenting on the HL2: Episode Two Steam Forums and PlanetPhillip), and so I’m confident this isn’t the last we’ll hear of each other. Remember; whatever happens, the Valve community will go on and so, LambdaGeneration will go on – slowly, but surely if need be. Good bye Vic, was great following and reading your news and articles. Hope this isn’t the last we see of you. Thanks for everything, dear Vic! Aww man, now you’ve got to find a torch-bearer. Good luck with that. Fare thee well, Vic. Been some great times reading your articles. Its been a great ride Vic. Ive enjoyed reading many of the things you have written for LG. Best of luck in all your future endeavors! 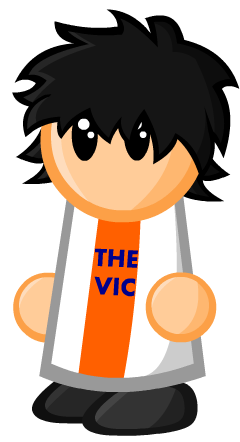 But thank you for all the awesome articles, Vic, they were just awesome! Thanks for everything, man! I personally am currently on a break from editing the wiki, but I’m also still here and still reading! Catch me later, I’ll buy you a beer! Thanks a lot, Vic. I’ve read every single article you’ve written since I started reading LG. And that was pretty much all of LG. Because of that, for me, you are LambdaGeneration and LG will never be the same. Best of luck, I look forward to your next project, and playing future Valve games with you as well… For once. Farewell, Vic! Thanks for all the awesome articles, Vic. We’re gonna miss you, and it’s sad to think we won’t be able to read you, one day, exclaim the words the entire community is waiting to hear. Hopefully someday we’ll see you come and make a one-time-only post on LambdaGen for old time’s sake. In any case, I kindly bid you adieu, and wish you the best of luck wherever you write in the future. Looking forward to seeing where the site goes next. It’s been a blast working with you, I hope you and I get to work together again in the future. May the force be always with you. Thanks for everything. Good luck sir. Really sad to hear that you’re leaving, but thanks for providing so many great articles over past couple of years. I have been a regular visitor for a long time thanks to your writing but I was expecting the worst considering the long gap in posts. Even so, I look forward to seeing the new direction that the site is going to take. This is sad news, as this site, and therefore you, my friend, was my source for pretty much any and all Valve news. It’s been a good run, and in the end, it was worth it. I wish you luck in future endeavors. You’ve done some amazing work for the community, Vic. Thank you for all of the hard work you put into this site. LambdaGeneration was always my number one Valve fan site, and it just won’t be the same without you. Nevertheless, I hope the site continues on, and I wish you the best of luck in all of your future endeavours. Thank you for your great dedication to the community, Vic! I’ve been visiting this site every day (it’s the second on my bookmarks panel), and every time you wrote anything, I couldn’t get my eyes off the text. Your articles are very informative, full of effort, and there is a lot of research put into every of them. It’s a really sad day for LambdaGeneration and the entire Valve community. Actually, I’m nearly crying right now. Anyway, I wish you the best of the best of luck, Vic. Thank you. LG will never be same without you Vic. Ciao. And GOOD LUCK on your future endeavors… hope to see you on Polygon sooner or later. This is a sad day for the site. LambdaGeneration’s success has been built upon the foundation created by Vic’s incredible dedication, effort and quality that he put into this website. It really will not be the same without you. You have been one of the most inspiring people that I have known in the Valve community, bringing a shabby little site running on a budget server to a global audience. I hope things work out for you in the future, and we look forward to seeing your presence on other sites or wherever you might go. I really think you have so much potential, and maybe a small fan site like this has held you back. Wherever you go, I wish you all the best, but at the same time I hope you keep around with us. This site wouldn’t have gottern anywhere without you, so I thank you, bid you farewell and wish you good luck! p.s. I hope one day we can hope to see a post from you here again!